Record-breaking round-the-world cyclist Mark Beaumont was joined by pupils from Kitearn Primary School and Dingwall Academy and local bike enthusiasts for a much shorter ride on a Ross-shire back road yesterday. He was in the area to perform the official opening of the Highland Farm Café at Mountgerald, between Dingwall and Evanton. 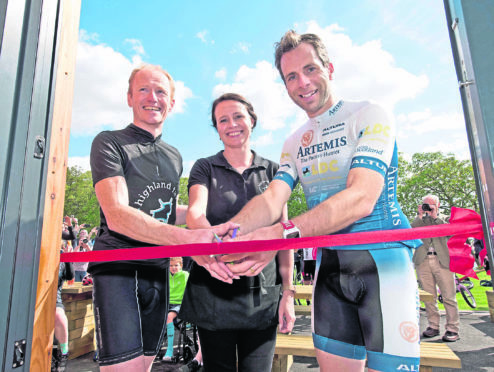 Mr Beaumont said the new eating place would be welcomed by thousands of cyclists tackling the NC500 road trip route and Land’s End to John o’ Groats rides, as well as other visitors. The café and shop, selling locally sourced produce, have been developed by Kenneth and Lesley McKenzie beside their award-winning holiday cottage business.